I cut small squares of card stock (I love my paper cutter!) and punched a hole in the middle of each one, then slid them over the hangers of the keepers-for-now. The idea is this: Every time I wear an item from now on, I will remove the tag. A year from now, anything that still has its tag is going to have to make a darn good case for me to keep it. Let’s see what I learn from this! Jane, how did you know I was thinking about clearing out my closet of the “unworn”! I love this idea!! 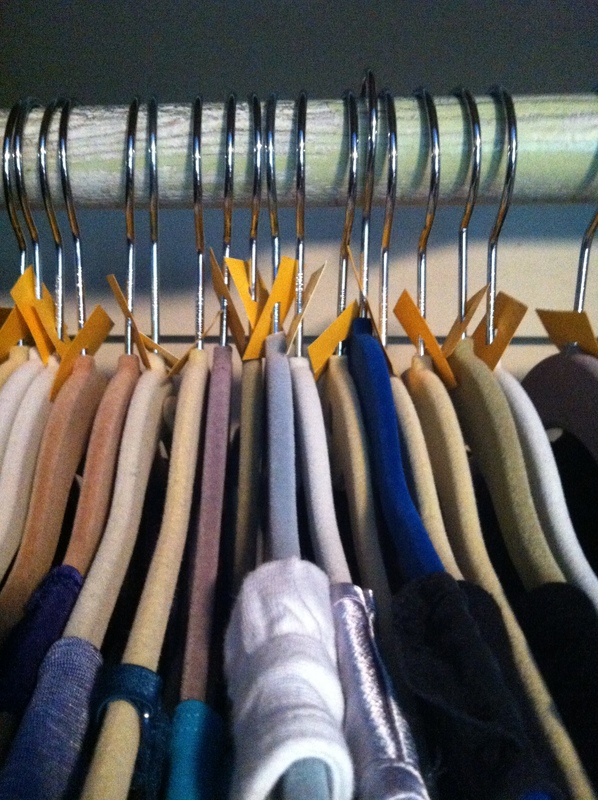 I have heard of another idea and that is to put all the hangers in “backwards.” As you wear an item, put the hanger in the “right” way. Then at the end of the year, you can easily tell what you have worn and what you haven’t. Not as colorful as the tags, but pretty easy to do on a whim.